Another photo with no details, this time a Pinarello Prince. I also crashed my Pinarello Prince. I was racing a provincial cup race and in the final sprint when another guy didn't hold his line and put me into the curb. I went upside down and over the bars into a huge tree. My team mates thoughtI was dead. My Prince had a small crack in the top tube. I had it fixed locally and I still race it. Carbon is so easily fixed now I can't see why anyone would ride anything but carbon. Sure it may not be as durable as Ti but its performs so much better why waste yout time with ti. Afterall isn't speed and performance your number 1 priority? Titianium is good for seatposts, and bolt kits. If Ti was so good for frames, why don't they use it for forks? Cuz its not stiff. 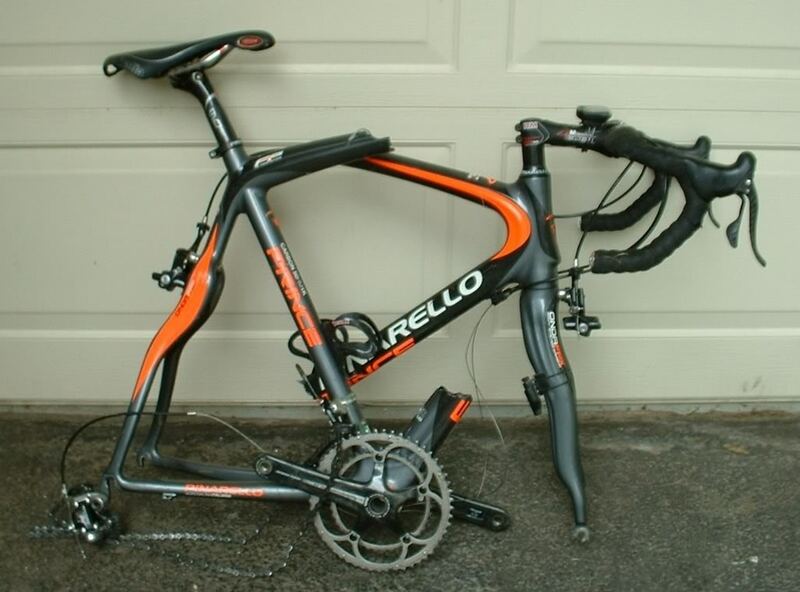 Is that the "Chinarello" carbon knock-off?